The Maker Movement is a group or culture of people who are interested in working with technology-based products to create new resources from old resources. They take things they have in their possession and repurpose them for a new and creative use. There are numerous resources out there for sharing ideas- and spreading the news about the maker phenomenon. Some of the creations are wild and wacky, and some might be on the verge of being the next “big thing.” Either way you look at it, the maker movement inspires creativity and the repurposing of products. What struck me most was an interview with the founder of the Maker Movement, Dale Dougherty. He stated that these people creating the products are “amateurs.” Considering what we have been reading from How People Learn, I would not consider the makers amateurs at all. But, definitely some type of expert learner. Now, it is true that the approach the makers use to experiment would tell what type of content knowledge and skills they have. Yet, they still hold an idea for repurposing or transferring one type of knowledge into something new. littleBits, a kit full of magnetic circuits. You may combine pieces to create a functioning circuit, with the power from the USB drive in your computer or charger. You can create switches that are motion sensored, dim LED lights, or change the speed of a fan. Raspberry Pi contains elements that are not labeled, and requires some more heavy research in order to operate and make the pieces functional. (This could be a steep learning curve for younger students) From what I could tell, you might be able to create a semi-functional computer, given you have all the parts you need. MaKey MaKey contains alligator clips, a USB cable, and a computer board. Here, you connect one end of the alligator clips to the computer board and the other end to an object that conducts electricity (banana, coin, pencil). Another alligator clip connects to yourself- and you can operate the mouse on your laptop or arrow keys while playing a game. Squishy Circuits holds multiple colored LED lights, a battery pack with cables, two sound making devices, and two recipes for play dough. 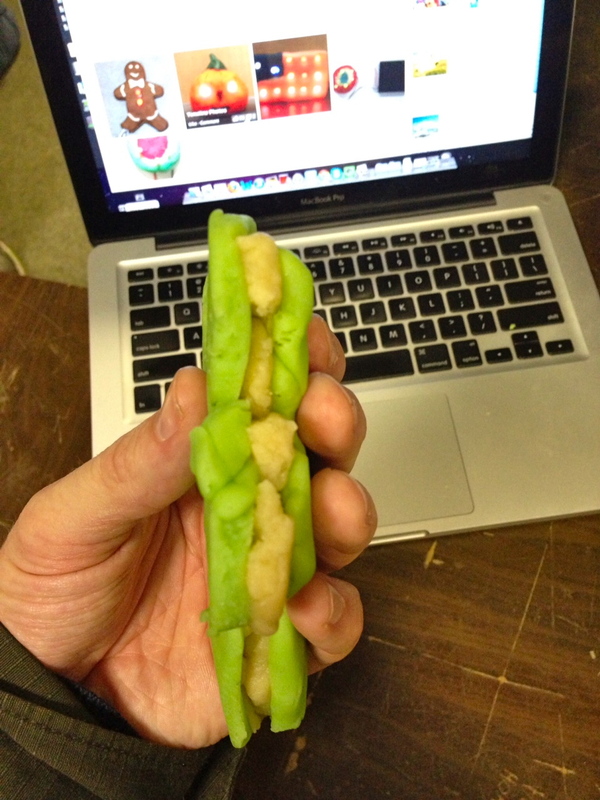 Here, you use the play dough as a conductor and insulator of electricity to operate the LED lights and/or alarms. In the afternoon we had the opportunity to visit an actual Maker Space, at 091 Labs, right here in Galway. It was pretty amazing that they opened their doors to us for the afternoon, as members are charged a fee. The space was rather what I expected. Sort of a hodge podge of “stuff” laying around- waiting to be used or experimented with. Mixed in with the organized chaos, were some high tech pieces of equipment; multiple 3D printers, a few computers, and other electrical devices. However, what we used most- was their space, and friendly expertise and guidance. I spent time exploring Squishy Circuits, as I feel they are very applicable to a unit my team does on Electricity. I also felt that the investment might be wise financially, as younger students and our Gifted and Talented program may find uses for the kits as well. I began by watching a quick TEDx talk on the circuits, and then just began playing- rather, making. I first attempted a basic series circuit, then moved on to the “sushi roll” or parallel circuit, before examining a Facebook page to gain more ideas. This is actually where most of my learning took place. 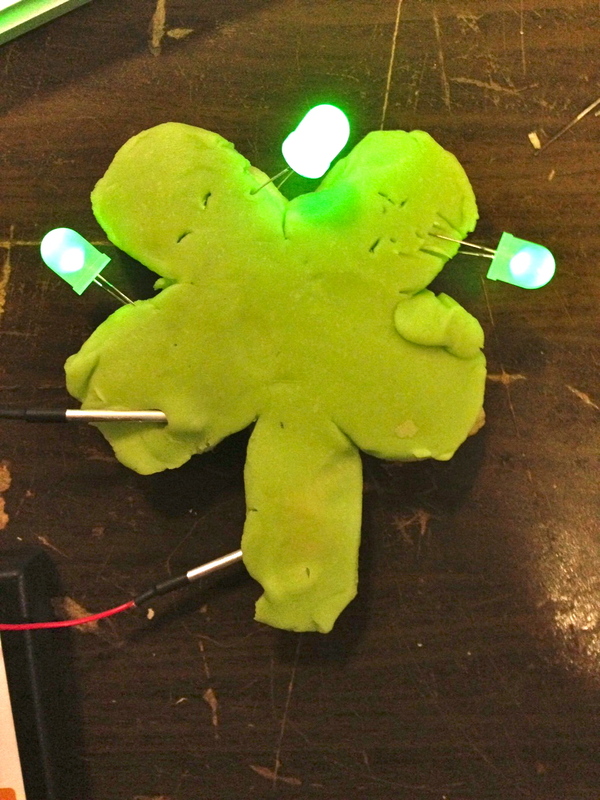 While attempting to make a shamrock that would light up on the tips of each of the 4 corners, I ran into problems. I had an idea as to how to solve this, but it just wasn’t working. That is when, Connor, a member of 091 Labs took notice. 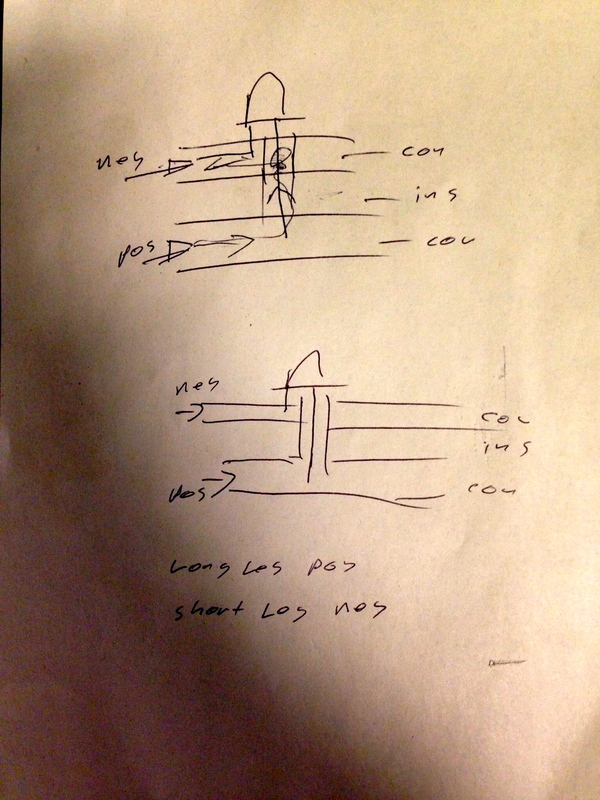 While showing him the image and explaining what I wanted to make, he watched and listened, and then explained to me his theory of how to make it happen. He must have seen a rather dazed look, as immediately- he turned around and actually grabbed an old textbook! Here, he showed me images of different circuits and spoke excitably, hoping I would understand. We attempted his new strategy, and were not successful. That didn’t stop us from continually trying different scenarios over and over, all the while discussing why or why not these attempts weren’t working. In the end, we actually could not come up with a lit up shamrock- although we did “cheat” a bit for the sake of a picture. But it was the learning that really stuck with me, rather than the failure. I viewed Connor as an expert of content knowledge. He knew the ins and outs of electricity and circuitry, which I did not. However, as stated in an earlier blog post, being a master does not mean you can teach the content. Sure, Connor grabbed a textbook, but it wasn’t affectively helping me take my current knowledge and extend it. He did not necessarily have the pedagogical knowledge/skill to see where I was coming from and where we needed to go. While I noticed this happening during the experience, I was also considering- what next? 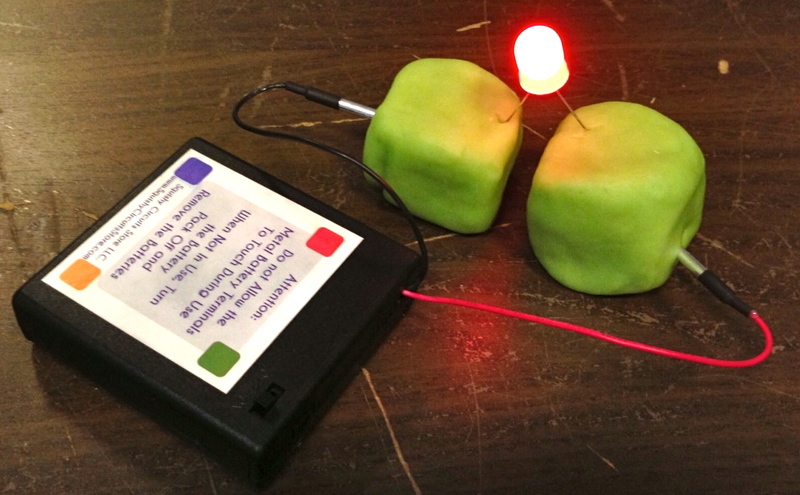 How could I repurpose these Squishy Circuits into something meaningful for my students? That is still questionable. However, just the experience that day is something I would love to pass on to my students- and really to fellow teachers, as a reminder of how important it is to focus on an effective pedagogy and using it purposefully. One last picture. While we were packing up, Connor had one last idea for making the shamrock light up, and he passed his blue print on to me. I will definitely be testing it out!